1. You can write your own HTTP module with .NET and integrate them into IIS 7.x processing pipeline. 2. 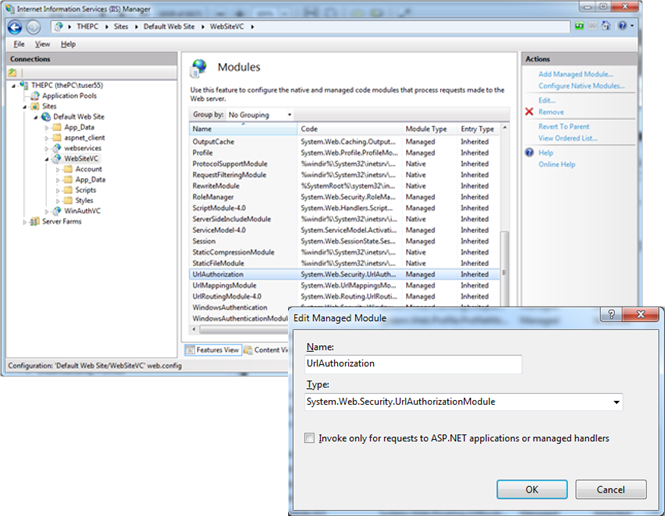 You can integrate existing ASP.NET modules such as the FormsAuthentication or the UrlAuthorization modules directly into the processing pipeline. 2. Use ASP.NET security for any other web application, even if it’s not written with ASP.NET. As soon as you have enabled the managed UrlAuthorization module, any resource of the website (images, text files or any type of file such as classic ASP or PHP pages) gets protected by ASP.NET security, as well. Now you can configure authorization roles for accessing all of these resources through the <authorization> configuration section within the <system.web> section of your web.config file which is looks similar to the following one. 1. The IIS 7.x authorization allows access to the website to any user, whereas the ASP.NET authorization clearly denies access to anonymous users. In addition, the IIS 7.x configuration includes both the ASP.NET FormsAuthenticationModule and the ASP.NET UrlAuthorizationModule in its processing pipeline, which means they will affect access to any resource—whether ASP.NET-based or not ASP.NET-based—within the web application directory. This also means that you can leverage roles managed by ASP.NET through the roles API and roles API framework for any resource hosted in an IIS 7.x web application. 2. Using the UrlAuthorization module of ASP.NET for the native processing pipeline only makes sense when not using Windows authentication. With Windows authentication you can configure any declarative authorization rules directly through the IIS 7.x management console to influence the out-of-the-box functionality provided by the native UrlAuthorizationModule shipping with IIS 7.x.